As I recall, he got blisters on his tongue. Hot peppers can definitely pack a punch, especially for those who haven’t built up much of a tolerance. Those of us who have, however, love them, the spicier the better. And if life was heat, cayenne was potent medicine indeed! And Thompson wasn’t alone in this belief. Following his lead, cayenne began to appear in patent formulas to cure everything from arthritis to indigestion to cancer to earache to tooth ache. Back to Samuel Thompson. Thompson was of the school of thought that impurities needed to be purged from the body, which basically meant vomiting, or as he put it (and this was the medical term of the time) “puking.” But puking also involved loss of “vital heat.” This, for Thompson, was a problem. So Thompson’s solution was to combine a lobelia, a strong emetic in high doses (but still useful in reasonable doses), with cayenne. So you puked to your heart’s content, but still had plenty of “vital heat.” Problem solved. (This might seem harsh, but bear in mind that back then, conventional doctors were also into purging impurities and excesses from the blood, only they used things like bleeding, and mercury). Today, Samuel Thompson notwithstanding, we know that cayenne is in fact a useful herb. But, like the radishes, it’s much underused. Perhaps Thompson’s legacy still haunts the plant. Or perhaps, like the radishes, people have an aversion to taking something so spicy. Cayenne and remember this now; this going to be useful in another six months or so is a wonderful winter tonic. It’s invigorating to the circulation, invigorating in general really. Think of it especially if your core feels fine, but your hands and feet tend to get cold. Cayenne disperses circulation from the core out towards the extremities. So in addition to hands and feet, it may have a certain, uniquely male function as well. Think of it, like the radishes, if cold and heavy foods like dairy and animal fat tend to sit sluggishly on your digestion. Cayenne is also useful for pain, especially topically. In fact, this is where most of the scientific research has focused. It depletes something called “substance P” here, P is for Pain so there’s less to make you actually hurt. It works on everything from shingles, to arthritis. And finally, I’d be remiss if I didn’t mention one very summery use for cayenne: in gardening. Boil a tablespoon of cayenne powder in a quart of water for a few minutes, strain, and then load it in a spray bottle. This completely non-toxic concoction will not only keep insects away from your crops, but deer and rabbits as well. 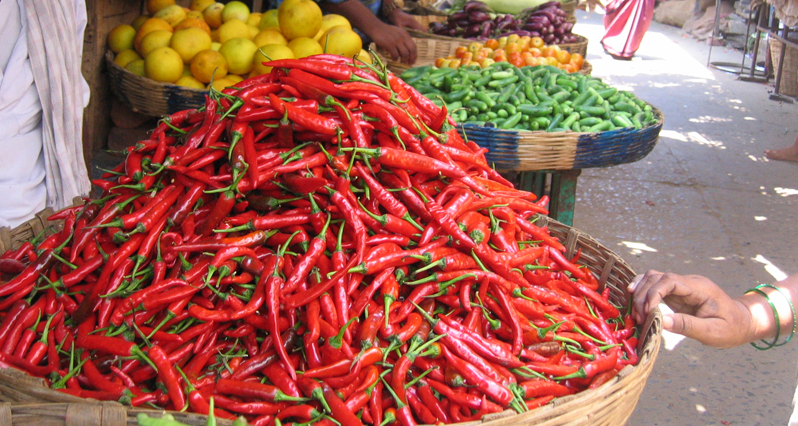 More than any other class of spicy foods, however, cayenne is one to steer away from if you are already energetically very hot (yang excess in Chinese theory). Ginger: Ginger gets its own category for a number of reasons. It does a lot of what cayenne does in terms of the circulation. And like cayenne, it’s an effective antioxidant. But ginger is also useful in a number of other ways. Ginger can soothe an upset stomach. It helps digest protein, and can quell nausea, whether caused by motion sickness, pregnancy, or other causes. For the nausea, ginger actually works better if you can taste it. So candied ginger, ginger ale, or ginger tea will work better than pills. Ginger also decongests us nicely, something that’s common to the spicy foods. Ginger is also a reasonably effective anti-inflammatory. Like papain (from papaya), and bromelain (from pineapple ? classified by the botanists as a bromeliad), it’s actually ginger’s protein-digesting components that work on inflammation. The trick is, to take ginger on an empty stomach. With food, the protein-digesting components tend to work on the food, not on the inflammation! Ginger is quite safe as well, unless taking very high doses irritates the stomach. Peppercorns: the stuff we grind up and call black pepper is actually completely unrelated to the peppers we buy fresh in the supermarket. In fact they’re the tiny dried fruits of a flowering shrub. While all sorts of medicinal properties have been attributed to peppercorns in the past, I don’t think of them as doing very much, with one, perhaps, very significant, exception. Black pepper is an irritant to the mucous membranes. For example breathe in some pepper dust, right into your nose: it’s so irritating, it’ll make you sneeze in an instant. In the gut, however, its irritation is slower, longer-acting, and much more valuable. Bear in mind that irritation produces a physiologic response, and sometimes that response is actually useful. In this case, irritating the gut lining stimulates it to absorb nutrients better. We know this mostly because of the research that’s been done on a proprietary extract of black pepper called bioperine. Bioperine has been shown to increase the absorption of a number of other substances, including CoQ10, zinc, and some of the active compounds in turmeric. The stats on turmeric in particular are especially impressive. It’s interesting: the company that makes bioperine claims that onlybioperine accomplishes this which plain black pepper does not. I’ve contacted them twice now to see if they can substantiate these claims and, so far, they have not gotten back to me. I think we can be fairly confident that any black pepper will work. Check out the new artisanal chocolate we’re carrying, spiced with Turkish urfa peppers! Those of us who really, really love the heat can be disappointed when we order our Chinese, or Indian, or Thai food “very, very spicy,” only to have it come to the table rated PG-13. The solution? Learn to order your ethnic food in its native tongue. Only when you can say “very, very spicy” in Chinese will the waiter take you seriously.